CTCI Waterloo, in Bathurst, NSW is a specialist in partitioning, particularly for wet areas such as bathroom lockers, showers and vanities. 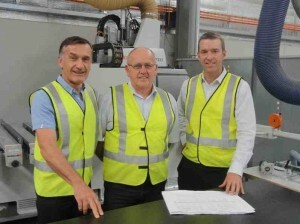 The company, now a subsidiary of Laminex, supplies Sydney, Brisbane and Melbourne. The company manufacturers regular product lines and a substantial amount of made to order contracts. When the company first started 14 years ago, the product range was innovative and new; now with a growing number of competitors, CTCI need to work smarter to stay ahead of the game. An ambitious goal to triple the business in five years meant planning a system of targets and improvements for all facets of the organisation. The Team Leading the Transformation at CTCI – Picture from L to R: Dennis Biasotto (Laminex), Eisse Woldhuis (CTCI), Anthony Clyne (TXM). At the recommendation of Laminex’ Dennis Biasotto, CTCI sought external advice from TXM Lean Solutions to identify areas for improvement. 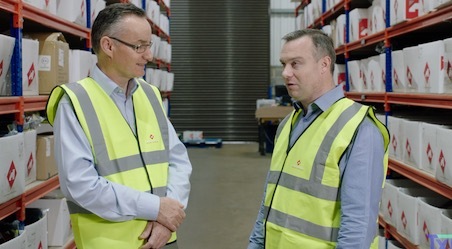 The key areas put under the spotlight were: paperwork flow from the time of order receipt to despatch; understanding of how the business is progressing; ensuring that the staff are fully utilised and working within a corporate environment. In the five months since TXM presented the workshops, CTCI have seen immediate benefits in communication flow from sales order to despatch, with lead times reduced by around 30%. Delivery on order KPIs are now at 98% from the 70% prior to the lean solutions introduction. “The results in the five months since the visit from TXM have been appreciable,” said David Norris, general manager at CTCI. “Other improvements have been our ability to better utilise the staff we have and the skills they possess. Our sales team now works more as a team, rather than as individuals, which means greater communication to get an order processed. As a result, we have reduced bottlenecks through manufacturing, we can see exactly where time can be better spent and our overtime rates have already dropped 25%”. By identifying opportunities to improve productivity and process flow, the team at CTCI are now better placed to achieve targets for future growth and meet their aim to triple the business in five years.